Land mines and nukes are two of the most terrifying weapons of war — for two very different reasons. Nuclear weapons can wipe out entire cities, and land mines wait buried in the earth, ready to harm anyone who wanders too close. In the 1950s, Britain tried to combine the two into a nuclear mine … with chickens as a heating source. Yes, this was actually proposed. But we’ll get to the chickens in a moment. The Blue Peacock would have been one of the worst kinds of Cold War weapons — a nuke the enemy doesn’t know you have. The United Kingdom sought to develop and deploy 10 nuclear mines. Once completed, it would ship the nightmare weapons to the British Army of the Rhine — the U.K.’s occupation force in Germany. The BAOR would then plant the landmines along the East German border in the north and detonate them should the Soviets ever try to cross the Iron Curtain. The project’s primary goal wasn’t to kill Soviet soldiers — though the blasts certainly could — but to irradiate and contaminate the North German Plain so Moscow’s troops couldn’t occupy it. “A skillfully sited atomic mine would not only destroy facilities and installations over a large area, but would deny occupation of the area to an enemy for an appreciable time due to contamination,” explained a Cold War era policy paper unearthed by Discovery. Scientists based the Blue Peacock’s design on Britain’s first atomic weapon — the Blue Danube. The Danubes were 10 to 12 kiloton bombs designed to free fall from planes. They looked cartoonish, like a bomb Wile E. Coyote might drop on the roadrunner. The Blue Danubes packed less of a punch than Fat Man and Little Boy, so in 1954, the British Army decided to adapt that tiny nuclear punch into a land mine. The War Office ordered development and the Royal Armament Research and Development Establishment set to work converting the Danube into the Peacock. In a few years, the researchers had a prototype. The nuclear land mine used a plutonium core surrounded by conventional explosives with twin firing pins. Steel encased the entire contraption. The project had several problems. First, compared to a conventional land mine, the Blue Peacock was massive. The huge cylinder weighed about eight tons. On its side, the circular mine was more than six feet high. Suffice to say, transporting and testing the weapon was an ordeal. To prove the weapon could even detonate, researchers dug up a gravel pit near Sevenoaks in Kent. Researchers placed the mine, flooded the pit and detonated the conventional explosives. The test did not involve nuclear materials. Researchers were just trying to prove whether the casing and firing pins would work. The next problem was friendly soldiers’ proximity to the detonation. Firing an atomic weapon without taking damage from the ensuing explosion is a classic problem of nuclear war. A plane can drop a warhead, flee the scene and escape the worst of the blast. But a smaller munition hidden under the ground or launched from artillery is a different story. The U.S. Army developed and deployed nuclear bazookas — the Davy Crockett — in the ‘60s, but the tiny nuke was still a nuke. It takes miles for the fallout from even a small nuclear blast to dissipate. The Pentagon thought better and shelved the project. Britain had a similar problem with its Blue Peacock. How could it detonate a nuclear land mine without being anywhere near the device? It came up with two solutions, one ingenious and the other bizarre. The first plan was to run three miles of wire from the land mine to an outpost where a soldier would detonate the explosives from a distance should the Soviets ever invade. Should that fail, or should the British Army know the Soviets were coming and had time to abandon the area, a single soldier could activate a clockwork timing mechanism attached to the mine. The timer lasted eight days. Once it wound down, the mine exploded. Vulnerability was the next problem. The U.K. needed a way to keep the Soviets from disarming the mines if Russian soldiers discovered them. Its answer was to make the mine tamper proof … by ensuring it would explode if someone messed with it. The British military scientists built the Blue Peacock a pressurized hull and tilt switches. If someone or something attempted to tamper with the mine, jostled it, filled it with water or pierced the hull with bullets … then the Blue Peacock would start a 10 second timer. At the end of those 10 seconds, the mine exploded. Heat was the final problem. 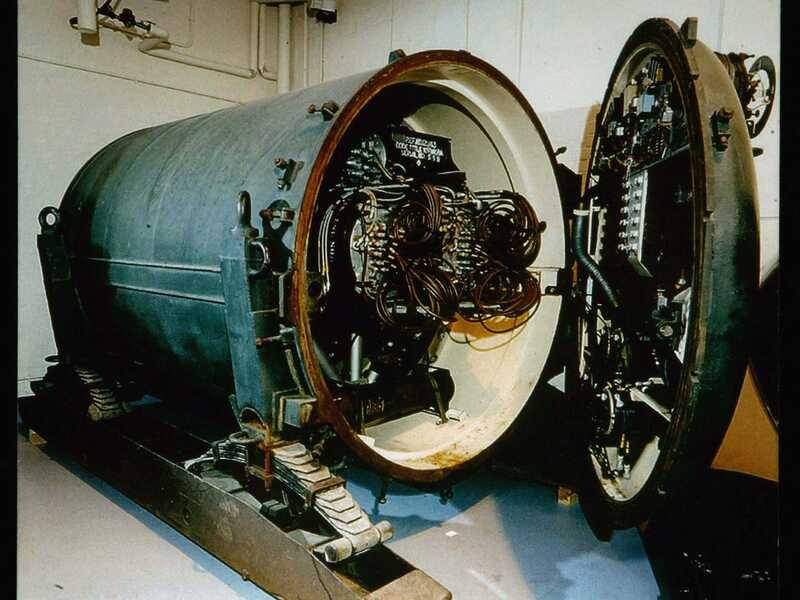 The electronics and conventional explosives in the Blue Peacock were susceptible to cold weather, and the entire system needed to stay within a narrow temperature range. If the ground in Germany dipped below a certain temperature, then it was possible the land mine wouldn’t detonate. Again, the researchers developed several innovative solutions to the problem. An early idea involved chickens. The mine was large enough and its interior spacious enough to accommodate living fowl. The idea was to toss in a few with enough seed to keep them alive for a few weeks. A soldier would switch out the chickens as needed. The scientists instead went with a more practical method of heat generation. They packed the mine with fiberglass pillows. Britain’s National Archives declassified much of the information surrounding Blue Peacock, including the chicken scheme, on April 1, 2004. The date of the release seemed ominous and some in the press asked the National Archives if the whole thing was an elaborate prank for April Fool’s day. “The Civil Service does not do jokes,” the National Archives told the BBC. The U.K. built two prototypes of the Blue Peacock, but shut the project down in 1957. Too many problems plagued the nuclear land mine, from its size to its weight to its reliance on fancy pillows. Storing a nuclear weapon on friendly soil during peacetime was politically unacceptable, the fallout would be too great and American and British scientists were hard at work on smaller, lighter and more dangerous warheads. The British Army shelved the project. One of the prototype Blue Peacocks is currently on display at the Atomic Weapons Establishment Historical Collection in England. Britain’s attempts to develop a nuclear land mine were crazy, but it wasn’t the only time a nuclear power attempted to develop mines and smaller, more tactical nuclear munitions. It was just one reflection of the mad logic that was 1950s atomic war planning.